In my role as the lead MVHR technician at Enhabit I receive lots of questions and queries about MVHR systems. I’ve collected together my responses to some of the most pressing concerns that people have with a home ventilation duct system – from airborne spores to cleaning, maintenance, kitchen extraction and financial payback. Residential MVHR systems – and the ducting they require – are a new concept for UK households, and it is entirely reasonable to be sceptical or concerned about them if you are building or renovating to very energy efficient standards. If you have any concerns that you’d like answered please write to me in the comments – I answer every comment I receive. We (Enhabit) have a network of trusted installers that we recommend. We conduct Quality Assurance (QA) checks on our own projects if installed by others. We are also not against having a client’s builder/plumber/electrician install the ducting themselves, and we make sure they are supported with guidance documents. Poor installation usually stems from a lack of proper design, using cheap and easily-damaged materials (eg, flexiduct) and no QA process. We make sure we have a proper 3D design, we use high-quality semi-rigid and steel ducting and we QA everything we design. 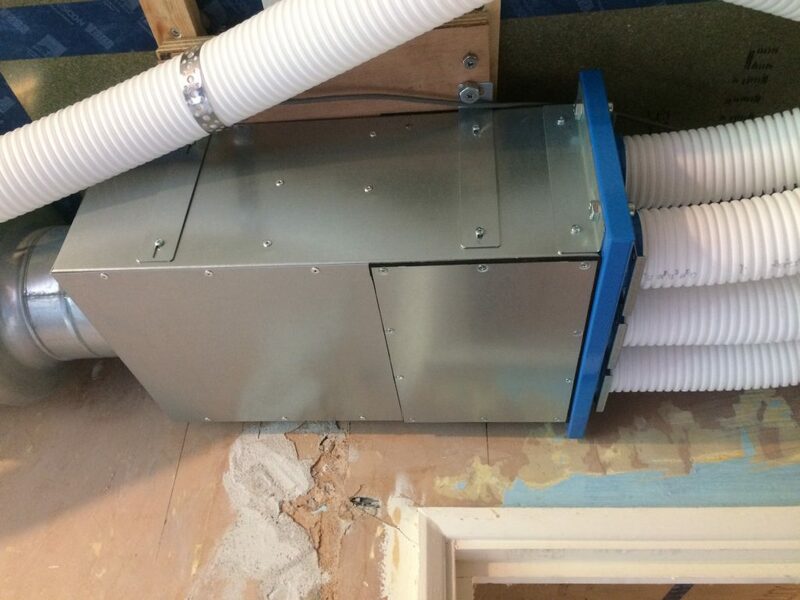 The semi-rigid ducting we use is smooth internally, which will limit dust sticking to the walls. The ducting we design in a radial format is a single length from valve to manifold, so it can be cleaned with a pipe cleaner. 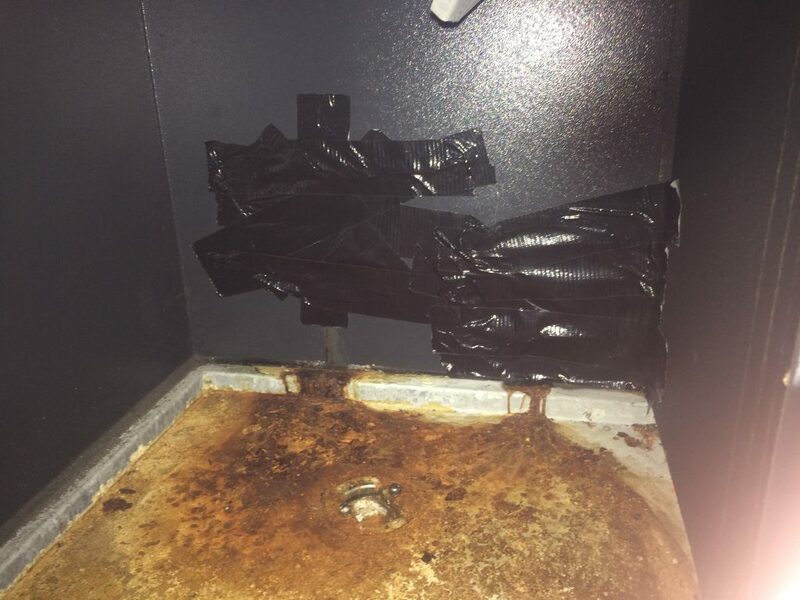 We put filters on each extract valve (where dust from the room will naturally accumulate) which can be taken out easily and cleaned/replaced to keep dust out of the ducts. We also put a grease filter on the kitchen valve to keep grease and dust out of the ducts. Finally, the unit has F7 and G4 filters which keep pollen, carbon dust and other nasties from entering the system/fans from outside, and these can be replaced and cleaned also. Sick Building Syndrome has many causes, but the main problems which cause health issues are excess humidity, excess VOCs (chemicals from glues, cleaners, etc) and excess CO2. Proper continuous ventilation prevents build-up of any of these problems, and an MVHR ensures fresh filtered and tempered air is consistently supplied, whilst extracting waste humid air that contains CO2 and VOCs. Using Low VOC paints and cleaners, and avoiding candles and air fresheners, is also a good strategy – no matter what type of ventilation system you have. Another cause of Sick Building Syndrome is standing water in the ductwork, causing rust, mould spores or similar nasty viruses. The evil is then carried around the building to infect inhabitants. In an MVHR system, however, the air is always moving – the unit is never turned off completely (instead, it has a holiday mode speed which turns it down very low when the occupants are away). In the above horrific image the MVHR was installed in a basement that had flooded, rusting the base of the unit. There are no dead legs in a radial MVHR system, and generally the system will be completely dry – cold air brought into a warm home will be naturally dried out. The condensate drain is a dry trap. All in all, then, there is little chance of mould forming, and the risk of legionnaire’s such as in water-based air conditioning systems (that offices have) is entirely minimised. I’d be more worried about dead legs in steel branch systems (mould and water vapour forming rust spots in areas of low air movement). With a radial system it’s one continuous duct, so a long pipe cleaner can do it easily. With a branch system (lots of bends) it’s more difficult but still not impossible. The manufacturers have dedicated technical teams, or generally if we (Enhabit) have installed the system then we’ll carry on the maintenance. MVHRs are incredibly simple machines (basically it’s just two high performance fans, a few sensors and a touchscreen) so there’s not a lot to go wrong. This depends on the client preference (eg, cooler bedrooms are nicer to sleep in). MVHRs are whole house ventilation systems, so they will generally create an even temperature range across the home. However, localised heating and cooling can still be used (eg, heater in a bedroom, or an AC unit in a loft area). MVHRs supply to bedrooms/living rooms and extract from bathrooms and kitchens. As an example, right now it’s really hot in London during the day, but temperatures at night are at 13 DegC. The MVHR will be supplying this cold outdoor air directly to the bedrooms throughout the night (automatic summer bypass), which is cooler air, so those rooms will be cooler. Proper duct sizing and installation, the use of drum acoustic attenuators and ensuring the specification of a properly sized unit from a good quality brand will ensure there are no noise issues. Noise issues should be designed out during the desk-based detailed ductwork stage, before a single duct is laid on site. We (Enhabit) haven’t seen any acoustic issues in 70 projects over the past two years, except one where a drum sound attenuator was missing from the installation (which we fixed and the issue went away). As above, the kitchen valve has a removeable grease filter to protect the ducts from airborne grease. It can be washed and/or replaced. The MVHR kitchen valve is located at least 600mm away from the cooker for this reason – we don’t want grease going inside it at all. You still need a dedicated cooker hood extract separate to the MVHR system, to catch airborne grease and exhaust it straight outside. The cooker hoods we recommend are re-circulating and use a carbon filter. The units are a large investment and therefore you are going to be living with it for some time. I agree completely. Generally though, as long as the filters are replaced regularly (at least every year, and more often in high pollution areas) there is little else to an MVHR system – as mentioned, they are mainly two high performance fans, sensors and a control panel. They use the energy of an LED lightbulb to run, so they’re very low energy. Yes, they will ultimately fail, but they should last a long time (a minimum of 10 – 20 years) with very little maintenance. Unfortunately, Enhabit’s oldest installed MVHR system is only 3 years old (we’re a young company), but it’s not had any issues yet. In Germany where MVHR has been prevalent for longer there are units that have been running for 25 years. Do you ever consider any of the other forms of ventilation at all? Yes, we use MEV systems, which extract continuously from wet rooms, in retrofit homes where the airtightness isn’t very good – but these are not as comfortable or energy efficient as MVHR systems. This is “System 3” in Part F Building Regulations, with MVHR as “System 4”. Given the comfort, health and energy efficient aspects of the MVHR system, it’s the industry leader for low energy homes. What do you think about the ground-tempered inlet pipes – good for keeping the intake air at reasonable temperatures in summer and winter? Yes, they are, but maintenance is a huge issue with these pipes so we don’t recommend them. Mould and mildew can build up in the ducts underground, which we absolutely don’t want as they’re hard to access and clean. MVHR systems are for renovated or newly built homes that have very high levels of airtightness as a result of works (eg, insulation, new windows and doors, proper weatherproofing), and thus require active ventilation (rather than trickle vents which we have in traditional homes). As such, ensuring good indoor air quality is the first priority for an MVHR system, not the financial payback. However, because they recover heat that would normally be lost to outside in winter, your heating system will not work as hard in winter, as up to 96% of the heat will be recovered back into the supply air. This is their second role. Finally, the high performance fans are very energy efficient – about the same energy usage over a year as an LED light bulb. Once you’re recovering more heat than you’re using running the light bulb, they are cost-positive. Overall, MVHR systems are excellent at providing comfortable, even air temperatures (pre-warmed air in winter) and good, healthy air quality – these are their main paybacks. Yes, the MVHR system will continuously extract out warm air from the home and input supply air, removing humidity also. Because this is a continual process 24hrs a day, when it’s cool at night the incoming air will cool the home. In summer the MVHR has an automatic summer bypass as well, which means when it’s very hot inside the air will be exhausted straight outside by the system. Yes, all of our MVHR systems have F7 and G4 filters which will filter out pollen, carbon dust, insects, etc from the incoming air. A NOx filter to filter out pollutants related to diesel exhaust fumes can also be fitted to an MVHR unit. Previous Article← Difference between a branch and radial MVHR duct system – and which is better?